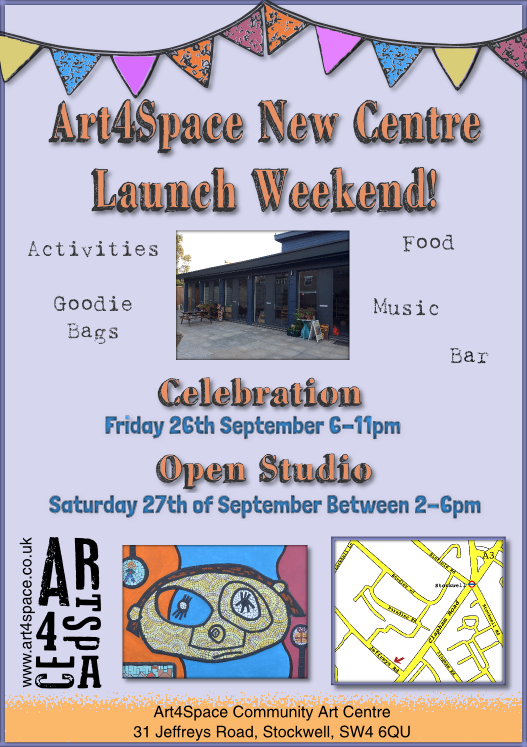 After 6 years of negotiations with the council and property developers, Art4Space are now in their new community arts centre and as such we would like to invite our community to the launch weekend. Friday will be more of a celebration with all our supporters and local community. Imogen Walker (local councillor) will be cutting the ribbon and Rosie Saunders from the BBC and channel 4 will be filming the event, there will also be drinks, food and entertainment. And Saturday will an open Studio for people and families to drop in and take a look at what we do. Everyone in our local community is welcome to join us in these celebrations. Full details of the event are in the flyer below.